Fort Harrison was the city’s major military facility before its closing in the 1990s. Beginning in 1902, the fort served in a training capacity for two World Wars, the Cold War, Vietnam War, and other U.S. actions. For many central Indiana men, the fort was a point of induction into or release from military service. It remains an excellent example of military facility planning from the early 20th-century and includes many of its original 1902-10 era buildings. In the wake of the Spanish American War, Congress established a series of regimental infantry posts to accommodate a vastly enlarged U.S. Army. In 1902, Congress established Fort Benjamin Harrison, and the Army began land acquisition in then rural Lawrence Township, northeast of downtown Indianapolis. The U.S. Army Quartermaster Corps used standardized building plans for the officers' housing, barracks, barns, and service buildings of the fort. Construction began in 1906, with most buildings finished by 1910. Other portions of the fort, extending to the north, saw construction of barracks in the interwar period. Sergeant’s Row, a series of doubles facing 56th Street, was added in 1931. The land-use planning of the fort is practical, and perhaps unexpectedly, very aesthetically pleasing. 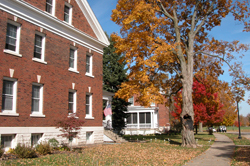 Lawton Loop, a naturalistic, roughly U-shaped drive, is lined with brick and stone-trimmed officers’ quarters, now converted to private housing. Former barracks buildings were sited along the east side of the drill grounds. The street pattern changes to a more utilitarian grid in the service areas to the east. In the 1990s, Fort Harrison was decommissioned. Private development has been allowed to use excess parts of the fort, adding new neighborhoods. Former officer housing and barracks have been rehabilitated for private use. The military still maintains a small portion of the site and the 1950s finance center across 56th Street. Much of the grounds were kept in a natural state during the Army’s stewardship of the base. The State of Indiana acquired this portion, along with the former Officer’s Club. Fort Harrison State Park is open to the public and includes hiking and horseback trails, golf, and dining facilities at the former Officers' Club. Fort Benjamin Harrison Historic District is located in suburban Lawrence Township, on the northeast side of town. The district includes Lawton Loop, Shafter Rd., Aultman Ave., and Glenn Rd. (roughly, the area north of the 8700 block of East 56th Street). The former officers' quarters are now private homes and offices. Restaurants and other convenience businesses have regular hours. Recommended: Park the car and bring out the bicycle for a pleasant tour. INDYGO bus line from downtown: #4 Ft. Harrison (outbound), disembark at Finance Center stop.